It will be like others who post fake news that will not stand scrutiny and resort to attacking the website or posting ad hominem attacks and the run away crying when their nonsense is shot down. DP, it appears your post is referring to me since I think I have been the only one posting on this string in favor of gun regulation in response to the firearm public health crisis. I know this is The Study but your criticism does not stick. I will be working on this. All of you, do your best to see merit in it before you label and dismiss it. “On February 14th, while we are remembering the seventeen students and educators shot and killed in their high school in Parkland, Florida last year, an Extreme Risk Protection Order bill will be introduced in Colorado. Extreme Risk laws, which now exist in 13 other states (Florida enacted its version following the Parkland massacre), allow families and law enforcement to seek court orders to remove firearms from a person who is dangerous to self or others. Studies indicate it can be used to reduce suicides, which is important for Colorado (which is a high suicide state) and for veterans and their families. Veterans commit suicide at a far higher rate than the general population. I see gun regulation as an issue of public health and safety. I am also interested to find common ground realizing we have very different opinions. I think this legislation could be an area of common ground and agreement. I look forward to reading it and encourage you all to do the same. MakMan, your progressive hypocrisy is infuriating to me. You've gone out of your way to say "this is about saving lives". That's total horse****. Progressive gun-banners like you don't care about saving life. If you did you'd be out fighting to protect unborn babies and speaking out about late term abortion. If you were worried about suicides, as I pointed out in a previous post, you'd at least give mention to other methods like hangings. But you don't. This is about taking guns away, plain and simple. It's so obvious that's it's laughable when you try your damnedest to convince me it isn't. You wanna do that, fine. You're free to be anti-gun. I don't agree with it but I support your right to your opinions. But at least man up and own it. Progressive lies about the intent of ANY gun-control legislation do nothing to promote understanding by my side. Every time you lie about the good intentions wrapped up in something like ERPO laws it serves nothing more than to harden my resolve against them. Try honesty for a change. You might find it refreshing. “On February 14th, while we are remembering the seventeen students and educators shot and killed in their high school in Parkland, Florida last year, an Extreme Risk Protection Order bill will be introduced in Colorado." Those students are dead because they were worth $58,000,000 dollars. Obama gave districts that reduced crime rates tax dollars. The only way this was done was by not arresting violators. Please describe a law that will prevent stupidity like that. "Extreme Risk laws, which now exist in 13 other states (Florida enacted its version following the Parkland massacre), allow families and law enforcement to seek court orders to remove firearms from a person who is dangerous to self or others. Studies indicate it can be used to reduce suicides, which is important for Colorado (which is a high suicide state) and for veterans and their families. Veterans commit suicide at a far higher rate than the general population." Please describe the protections for those who are not dangerous. "I see gun regulation as an issue of public health and safety. I am also interested to find common ground realizing we have very different opinions. I think this legislation could be an area of common ground and agreement. I look forward to reading it and encourage you all to do the same." I notice you have already changed your comments to "gun regulation". Please don't try to BS an old prison teacher. "DP, it appears your post is referring to me since I think I have been the only one posting on this string in favor of gun regulation in response to the firearm public health crisis. I know this is The Study but your criticism does not stick." Don't flatter yourself or even assume I was addressing this thread only. "Unfortunately for gun control advocates, Illinois law enforcement released a key detail Saturday busting the narrative that more gun control may have prevented Friday's tragedy. According to law enforcement, the killer was a convicted felon. That means he was already ineligible to purchase or possess a firearm. 'He absolutely he was not supposed to be in possession of a firearm,' Aurora Police Chief Kristen Ziman said Saturday, according to NBC News. Ziman explained at a press conference that the killer purchased a .40 caliber Smith & Wesson handgun on March 6, 2014 after being issued an Illinois Firearm Owner's Identification Card, or FOID." WRSP reports that Illinois’ red flag law went into effect on January 1, 2019. They also have a 72-hour waiting period for gun purchases, licensing for gun owners, and universal background checks. 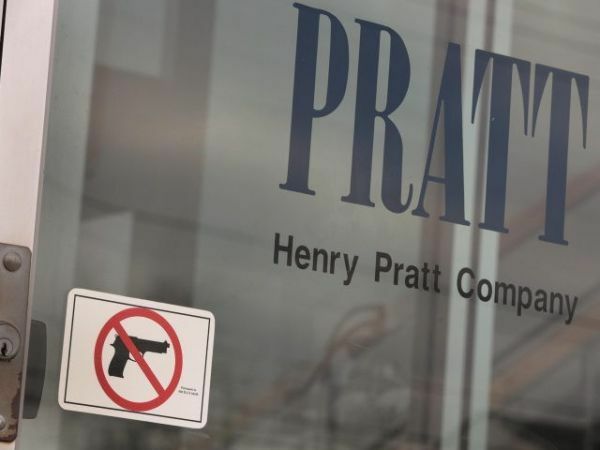 None of the gun control prevented Martin from entering Henry Pratt Company and opening fire. Now maybe the childishly naive will stop pushing their “do something even if it won’t work” solutions, just because they sound good. And by the way - the Henry Pratt Company is a "gun free zone". How long will it take for "extreme risk" means "he has guns". House Bill 19- 1177: Extreme risk protection order or "red flag" legislation sponsored by Majority Leader Alec Garnett (D-Denver) and Representative Tom Sullivan (D-Centennial), would authorize the seizure of firearms and ammunition from individuals without due process. Unchallenged statements made by a petitioner before a judge, alleging that someone is a danger to themselves or others in an ex parte proceeding -- prior to any formal court hearing at which the respondent can be represented by counsel and present counter evidence -- would be sufficient for law enforcement to enter that person's home and confiscate their private property. Unchallenged statements made by a petitioner before a judge, alleging that someone is a danger to themselves or others in an ex parte proceeding -- prior to any formal court hearing at which the respondent can be represented by counsel and present counter evidence -- would be sufficient for law enforcement to enter that person's home and confiscate their private property. "Useful Idiots" support this kind of stupid "red flag" legislation because on the surface it sounds good (like socialism or gun free zones). They either don't care or don't understand the dangerous unintended consequences.